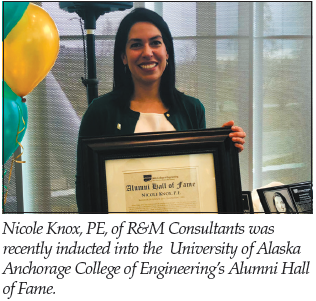 The University of Alaska Anchorage College of Engineering held its Spring Celebration on May 4 and inducted Nicole Knox of R&M Consultants Inc. into its Alumni Hall of Fame. College of Engineering alumni are inducted as a way to recognize their outstanding accomplishments and honor they bring the college by distin­guishing themselves through their pursuit of excellence in engineering, leadership, professional achievements and history and connection to the college. “For a third year, UAA College of Engineering is honoring outstanding alumni who have made a significant difference in engineering in our state with induction into the Alumni Hall of Fame,” said Fred Barlow, Ph.D. and dean of the UAA College of Engineering, during the induction ceremony. Over her 15-year engineering career, Knox has made many signifi­cant contributions to the engineering field. She is a lifelong Alaskan who grew up in Anchorage and earned a Bachelor of Science in Civil Engi­neering degree from UAA in 2004. She worked as an engineering intern at ASCG Inc. during school, then moved to R&M shortly after graduating. She steadily progressed from staff engineer to project manager to senior project engineer and became a shareholder of the company in 2012. She was promoted to group manager of site development for the company in 2017. Knox’s network includes large and small, public and private site devel­opment projects throughout Alaska, each with their own unique chal­lenges. Notable projects include the Anchorage Museum Expansion, UAA Alaska Airlines Center, Fire Station No. 5 and Downtown Soup Kitchen. Her expertise includes site layout, grading, storm water management, utility design, pedestrian and vehicle access, and circulation analysis for schools, parks and public facilities. Knox also contributes a signifi­cant portion of her time to mentoring engineering students and young professionals. She is actively involved in local professional organizations, serving concurrently on multiple boards and committees, including UAA’s College of Engineering Advi­sory Board. Knox is also a supporter of many local nonprofits and commu­nity organizations. She was a junior girls volleyball coach from 1998 to 2014, can’t say no to Girl Scouts with cookies to sell and loves getting out as often as possible to support and enjoy local arts and music. Founded in Alaska in 1969, R&M offers civil, structural, geotechnical and waterfront engineering; surveying and mapping; GIS services; geology; hydrology; environmental services; transportation and land use planning; public involvement; right of way and lands consulting services; construction administration; materials testing; and special inspection. R&M has offices in Anchorage and Fairbanks. Geotechnical and environmental engineering firm Shannon & Wilson Inc. announced the addition of two new board members in April: Meg Strong, LG, LHG and vice president, and Bob Mitchell, PE, PEng and vice president. A geologist, hydrologist and group leader of Shannon & Wilson’s envi­ronmental department, Strong brings 27 years of experience managing, investigating and providing strategy for environmental issues for corpora­tions and municipalities. Having joined Shannon & Wilson in 1997, Bob Mitchell specializes in g e o t e c h n i c a l and geotech­nical earthquake engineering for design-build and design-bid-build projects across North America. “We are very pleased to have Meg and Bob join our board and look forward to their contribu­tions,” said Greg Fischer, senior vice president and chairman of the board. “Their individual talents and exten­sive experience in the areas of geotech­nical and environmental engineering will undoubtedly benefit our company and clients, continuing Shannon & Wilson’s tradition of technical excel­lence and project success,” he said. Strong and Mitchell join board members Gerard Buechel, Shannon & Wilson president; Greg Fischer, senior vice president and chairman of the board; Matt Hemry, vice president; Neal McCulloch, vice president; and Russ Schwab, vice president. Shannon & Wilson, Inc. is an employee-owned geotechnical and environmental engineering firm with over 300 employees in 12 offices across the United States. 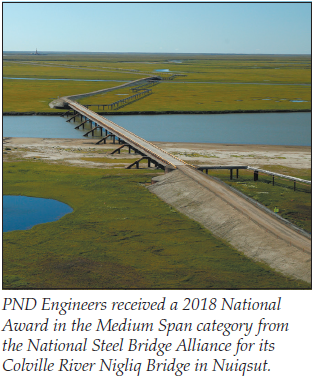 PND Engineers Inc. received recognition from the National Steel Bridge Alliance, or NSBA, a division of the American Institute of Steel Construction (AISC), for two separate bridge projects in the 2018 Prize Bridge Awards competition: a National Award for the Colville River Nigliq Bridge in Nuiqsut, Alaska, and a Merit Award for the Moose Run Golf Course Bridge in Anchorage, Alaska. The NSBA hosts the competition bi-yearly and awarded a total of 16 bridge projects from across the nation this year. The Colville River Nigliq Bridge, which PND designed for ConocoPhillips Alaska Inc. won the National Award in the Medium Span category for the longest span between 140 and 249 feet. The bridge acts as a gateway to the National Petroleum Reserve and grants access to the large industrial traffic necessary for operation of the new developments in the reserve such as CD5, GMT1, and GMT2. The bridge successfully addressed significant operational and construction issues including significant flooding events, massive ice loads and complicated soil conditions. Design addressed construction concerns such as severe winter weather, a highly compressed schedule, limited access, stringent environmental requirements, very challenging foundation installation, and logistical constraints. PCL Construction was the bridge construction contractor; Jesse Co. was the bridge fabricator; and PND provided permitting, foundation design, structural engineering design and construction inspection. 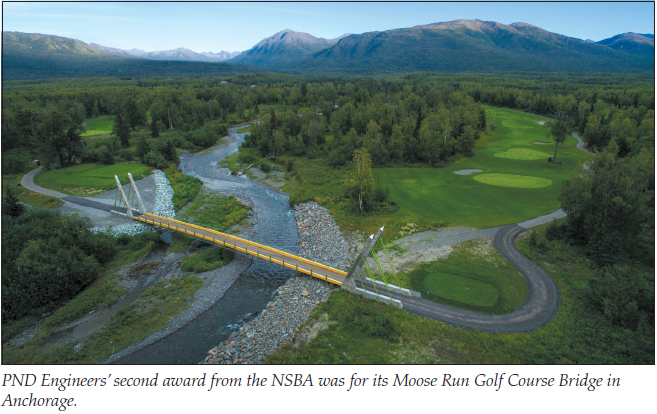 PND’s Moose Run Golf Course Bridge, designed as a Strand Bridge, earned a Merit Award in the Special Purpose category, which includes pedestrian, pipeline, and airplane bridges. A Strand Bridge is a unique suspension system, developed by PND, which uses vertically harped and horizontal strands to form the bridge support, provide for bridge erection, and form the final hand rails. Unlike the bulky truss and beams of more conventional designs for a 200-foot-long clear-span pedestrian bridge, this unique design is highly constructible — there’s no need for extensive temporary aerial catwalks and gantries due to the design — and provides fine architectural lines and artistic elements that complement the natural setting, while also providing visually pleasing access for use by pedestrians, golf carts and groundskeeping equipment. Moose Run Golf Course-Joint Base Elmendorf-Richardson is the owner of this project. Swalling Construction Company was the design-build contractor with PND as the prime designer, working as a team for Frawner Corporation, which holds a term construction contract with JBER. Jesse Co. was the bridge fabricator. PND provided permitting, geotechnical investigation and design, structural engineering design and construction management/inspection. The Prize Bridge Awards competition is held every other year and honors significant and innovative steel bridges built in the United States. Winners are chosen based on their significant innovation in U.S. steel bridge design and engineering. Awards are given in nine categories including: Major Span, Long Span, Medium Span, Short Span, Moveable Span, Reconstructed Bridge, Special Purpose, Integrated Project Delivery and Technological Advancement. The 2018 Prize Awards were presented at the 2018 NASCC: The Steel Conference/World Steel Bridge Symposium held April 11-13 in Baltimore.